Under the Oak Tree: Welcome! Welcome to Under the Oak Tree -- the Arington Tree Farm blog. 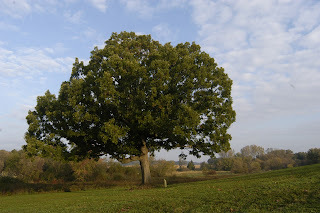 The blog gets its name from everyone's "favorite" tree - a beautiful white oak that sits near Husker Barn. Is it politically incorrect to pick a favorite when you're on a tree farm? We hope not! This oak is over 100 years old and it's sturdy trunk and wide canopy make it the "picture-perfect" tree. We even based our ATF logo on it! The Great White Oak - our "favorite" tree! We'll use this space to share what's happening here on the farm. There's a lot of work going on every day, between the stands that need pruning, invasive species that need spraying and firewood that needs cutting. There's also a lot of wildlife to be checked upon and flowers to be tended to. 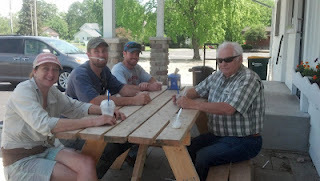 That said, we still find some time to have fun, like today's field trip to the ice cream shop in town. Ice cream break - yes please. We hope you enjoy Under the Oak Tree and check back often to see what we're up to!